kyith - Would it be Possible we need to Save Much Less for Retirement? Suppose you need to spend $40,000/yr the next year for your family. The 4% withdrawal rate is tested through historical rolling 30 year periods, on a 50% equity 50% bonds allocation. 4% gives a high probability your money would last 30 years. It is inflation adjusted and therefore preserve your purchasing power. So could we use this to evaluate we are ever ready to not work? In yesterday’s New York Times article, a 35 year financial planning veteran presents some real life contrast to using the simple 4% withdrawal rate. I think this is not the first article to point out about the spending trends. There are some recent research that says your spending tends to go down over time. David Blanchett, head of retirement research at Morningstar thinks the spending resembles more of a smile. It does down then comes back up. The later years spending usually is related to healthcare. Mr Blanchett suggest the financial planner create an alternate projection where inflation is 1% less. Generally, I think you got to trust a little what a veteran financial planner says. They probably observe enough of how retiree spends to make that comment. However, this article sought to give confidence to people. And generally research Michael Kitces have emphasize that the 4% withdrawal rate is the worst case scenario. In a lot of the 30 year rolling periods, the rate of return on a 50% equity and 50% bond allocation is higher, and thus can condone a higher withdrawal rate. You would need 10% to 20% less. However, there are caveats to this. Your expenses are more likely to go down if your spending is not the super frugal sort. Your expenses could include helping out your children in their daily living, education, going for holiday. Thus, if your expenses is already super frugal, you might not experience a sharp drop in your expenses like the go-go, slow-go and no-go scenarios. 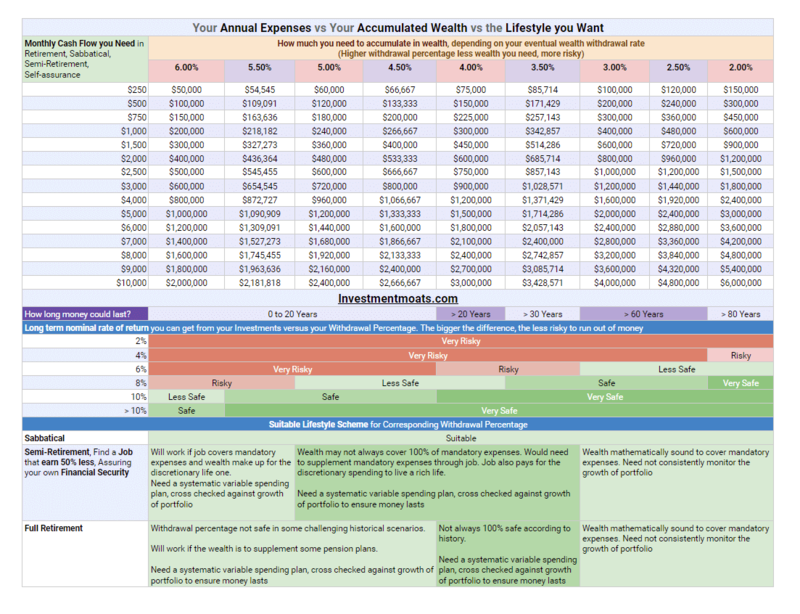 You would need to understand your annual expenses well. To sum it up, here is how you can visualize your withdrawal rate. This will make up 5% but essentially what is important to you is that 3-3.25% withdrawal rate. the other 1.75% to 2% is to be cut down if the situations get a bit challenging. In short, we called this variable withdrawal spending (read my guide here). A lot of you are planning in mind that you would never have to go back to work. That is a psychological thing and we all define risk adverse very differently. For some of you, you wish absolute safety, then I would say, shoot for 3-3.25% withdrawal rate. So if you need $40,000/yr then its $1.23 mil. For some, you have high confidence you could always go back to work or have some ways to cut your expenses, then its 5%, knowing you can cut to 3.5% if you need. You can work with $800k or 30% less. Going back to that example, suppose your current family expenses is $3000/mth. Based on the 4% rate, you would need to accumulate $900,000. If the average rate of return you get is around 6%, it is rather risky, but if its 8% its not very safe but its doable. Your money probably will last between 20 to 30 years. These are based on worst case scenario. Those who are more risk adverse would step down to 3.0%. They would need 30% more to accumulate to 1.2 mil. Even a 6% rate of return might be workable. Their money would last 60 years. The risk seeking ones can work with a withdrawal rate of 5.0% and aim to achieve 8% investment rate of return. Their wealth covers majority of their mandatory expenses, while the work covers part of their mandatory expenses and most of their discretionary expenses. While traditionally a 5% withdrawal rate can run out in 20 years, supplementing with work can extend this and make it viable. Thus, you might need less money, but you might be so risk adverse that you do not feel safe. DoLike MeonFacebook. Join my Email List. I share some tidbits that is not on the blog post there often.